Over a span of two months back in 2013, Marvel Studios won back the movie and TV rights to four of their iconic comic book characters, Daredevil, Ghost Rider, The Punisher and Blade, which had been developed as movies by other studios prior to the formation of Marvel Studios. Marvel has already put one of these characters to good use, with the Netflix series Marvel's Daredevil. The Punisher (Jon Bernthal) is set to join that series in the upcoming second season. There have been rumors swirling about new TV shows for both Ghost Rider and Blade, but while promoting his new NBC series The Player, Wesley Snipes revealed it's possible that his beloved Day Walker character could cross over with The Avengers. About joining the iconic superhero team on screen, he had this to say. "That would be interesting. I mean, I know it's in the comic book. It would be interesting to see where they would place him and where he really would fit in. He's got to bite somebody. I don't know who he's going to bite." In the comics, Blade did appear in in the Civil War comics, after registering under the Superhero Registration Act and fighting with S.H.I.E.L.D. The Day Walker was later revealed to be fighting under the identity of Ronin in a comic book series known as The Mighty Avengers, the first officially registered heroes. There were various different versions of The Mighty Avengers, with team members including Iron Man, Ms. Marvel, Hank Pym, Luke Cage and Monica Rambeau. Wesley Snipes teased at Comic-Con that he has had discussions with Marvel about making Blade 4. Another report surfaced in August that claimed Marvel is in fact developing a reboot, but Wesley Snipes' Day Walker would actually be a secondary character, a mentor who trains his daughter to hunt and kill vampires. While none of these reports have been confirmed, Wesley Snipes confirmed again that talks are in place, but he doesn't have anything concrete to report quite yet. "There's always a possibility, you know. It's in Marvel's hands. They're controlling the pace and the flow with that. Conversations have been good. They see the value in it. We see the value in it. I'm still in shape enough and fit enough to handle the role. We'll see how it goes. I don't really know what's going to happen to it yet." 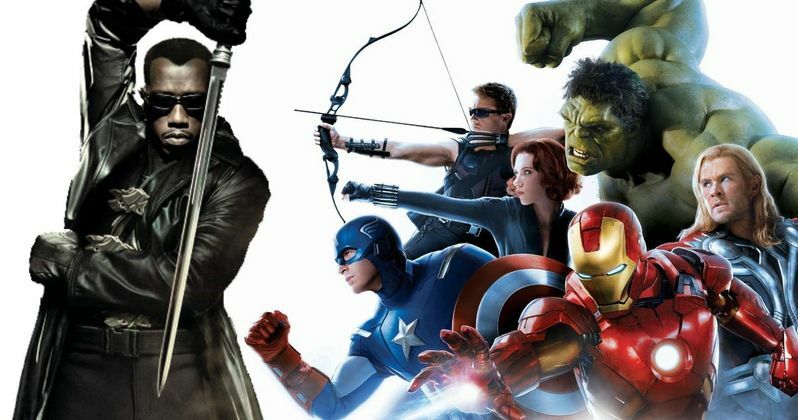 Do you think Wesley Snipes' Blade would make a good addition to Earth's Mightiest Heroes? It's worth noting that we know virtually nothing about Marvel's plans for Phase Four so it's possible that they could find a home for the Day Walker there. Hopefully we'll find out more about this potential crossover soon, so stay tuned for more details.